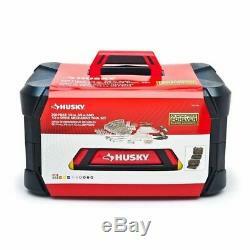 The Husky 268-piece 1/4 in, 3/8 in. 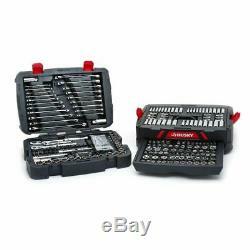 Drive mechanics tool set is one of the most comprehensive tools set for professional or DIY mechanics workshop. The 168 different standard and deep sockets along with the 20 combination wrenches and 19 bit sockets will allow you to tackle any fastening or repair project. 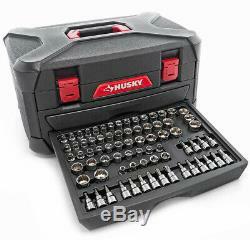 This Husky 268-piece tool set will provide the novice or professional with a huge assortment of durable and reliable tools to get the job done. 72-tooth ratchets need an only 5° arc swing to turn fasteners. Quick release button allows sockets and drive tools to be easily removed from the ratchet. Full polished chrome finish easily wipes clean of oil and dirt. Tools are forged from chromium-vanadium (Cr-V) steel for outstanding durability and strength. Sockets and wrenches feature chamfered lead-ins help to provide fast and easy placement onto drive tools and fasteners. Sockets and wrenches are designed with off-corner loading to help prevent rounding of fasteners. Wrenches feature a 12-point box-end design and 15° offset increases clearance. Bit sockets attached to 3/8 in. Drive tools provide a longer handle and more leverage than standard hex keys or screwdrivers. Chrome finish provides corrosion resistance and added durability. Large, hard-stamped size markings allow for easy readability. Hex keys, screwdriver and nut driver bits are formed from heat-treated S2 tool steel for added strength and wear protection. 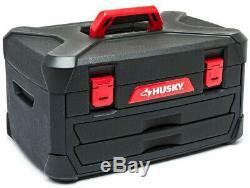 Plastic storage case is stamped with size markings for easy identification and organization. Husky mechanics hand tools are guaranteed forever, if your Husky hand tool ever fails, bring it back and we will replace it free. 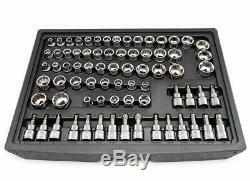 Set includes three 1/4, 3/8 and 1/2 in. Quick release ratchets, 23 standard length 1/4 dr. Socket, 10 standard length 1/4 dr. Socket, 21 deep 1/4 dr.
Socket, 28 standard length 3/8 dr. Socket, 5 standard length 3/8 dr. Socket, 22 standard length 3/8 dr. Socket, 16 deep 3/8 dr. Spark plug socket, nineteen 3/8 dr. 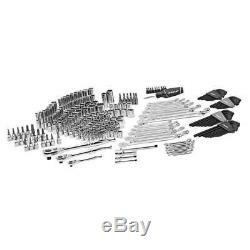 Bit socket, 22 standard length 1/2 dr. Socket, 20 combination wrenches and 77 other accessory and dr. Hand Tool Type: Tool Set. Multiple Tool Set Type: Mechanic Sets. 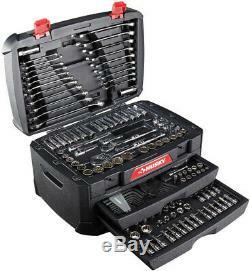 Tools Included: Combination Wrench, Hex Keys, Multi-Bit Screwdriver, Nut Driver Bits, Ratchet, Screwdriving Bits, Sockets. Tools Product Type: Hand Tool. Customer service is our top priority! Please be sure to read the description thoroughly to make sure that this is the item you want before making a purchasing decision. We make every effort possible to accurately describe and depict the items. Please be aware that slight variations in color may be due to differences in lighting and computer monitor resolutions. Thank you for shopping with us. If ordering electrical items outside of the U. Please note that they will come equipped with a standard U.
Voltage plugs and run on 120 Volts. We assume no responsibility if the items malfunction or causes an accident because one tried to use the product with foreign electrical standards. The use of a converter or other voltage transforming device is at your own risk. You will need a suitable adapter to use the item in your country. An adult signature will be required. Please be sure to have available help on hand to assist you with moving the item to the desired location in or outside of your home. Only factory defects are accepted as a reason for a return. In the case of factory defects, if available, we will replace the product for you. When returning an item, it must be in all of the original packaging and include all of the original accessories or items that came with it. The item and package should be in original and perfect condition. We do our best to process as quickly as possible. Orders are processed immediately and dispatched to fulfillment as soon as they are received. For this reason, we are typically unable to honor cancellation requests. If the order has gone too far through the fulfillment process, we will be unable to cancel. 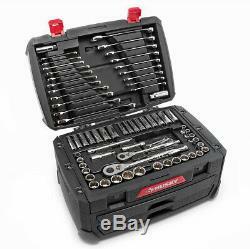 The item "268-Piece Husky Mechanics Tool Set w Case SAE Metric Sockets Wrenches Repair Kit" is in sale since Sunday, March 17, 2019. 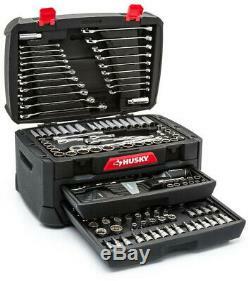 This item is in the category "Home & Garden\Tools & Workshop Equipment\Hand Tools\Hand Tool Sets". The seller is "bluelightspecial32" and is located in US. This item can be shipped to United States.